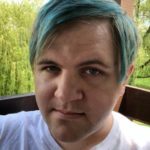 Cody Mejeur is a PhD candidate in English at Michigan State University specializing in new media, narrative, queer studies, cognitive humanities, and digital humanities. Their work uses video games to theorize narrative as a living, emergent, and playful process that contributes to how we understand ourselves and our realities. They have published on methods for using games in pedagogy, gender and queerness in games, and the narrative construction of reality. They currently work with the LGBTQ Video Game Archive on preserving and visualizing LGBTQ representation in video games. They are a graduate lab lead in MSU’s Digital Humanities and Literary Cognition Lab and adjunct faculty at Ivy Tech Community College. “Serious Play: Critical Game Studies in an English Setting”. The Atrium: A Journal of Academic Voices (Spring 2015). “Chasing Wild Space: Narrative Outsides and World-Building Frontiers in Knights of the Old Republic and The Old Republic”. Star Wars and the History of Transmedia Storytelling, edited by Dan Hassler-Forest and Sean Guynes, Amsterdam University Press, 2017. 199-212. “Pokémon GO, Narrative, and the Construction of Augmented Reality”. Not Just Play: Essays on Motivations and Impacts of Pokemon GO, edited by Jamie Henthorn, Andrew Kulak, Kristopher Purzycki, and Stephanie Vie, McFarland Press, 2018 (in press). “‘Look At Me, Boy!’: Carnivalesque, Masks, and Queer Performativity in BioShock”. Beyond the Sea: Critical Perspectives on Bioshock, edited by Felan Parker and Jessica Aldred, McGill-Queen’s University Press, 2018 (in press). “Breaking Neuro Ground”. Co-authored with Natalie Phillips, Salvatore Antonnuci, Melissa Klamer, and Karah Smith. Further Reading, edited by Matthew Rubery and Leah Price, Oxford University Press, 2018 (forthcoming). “The Hunt for Queer Spaces: Indie Games, Representation, and Limited Worlds”. Indie Games in the Digital Age, edited by Cynthia Wang and Michael J Clarke, Bloomsbury Press, 2019 (forthcoming). “Queer Game Studies”. Postmodern Culture (Winter 2018-2019), Book Review (forthcoming). “Embodied Cognition and Queer Minds in Video Games: Narrative Interfaces and Orientations”. Modern Language Association 2019, Chicago, IL, January 2019.